Let the deluge of Star Wars: Episode VII rumors continue. Yesterday we got our first look at the redesigned stormtrooper helmets, a peek at a couple of Han Solo’s possible costumes from the J.J. Abrams-directed space opera, hints about important flashbacks, and rumors about who the villain(s) might be (including a concept artist’s rendition of one of them). That makes for a busy day, but that’s not all. Now we have heard rumors about the vehicle, or at least one, that Han will be driving around that far, far away galaxy. Possible SPOILERS for Episode VII await you beyond this point. You’ve been warned. Also, these are unofficial rumors, don’t take them too seriously. We don’t actually know anything. You may read this and say to yourself that this is a bunch of hooey, Han Solo is going to pilot the Millennium Falcon, end of story. The iconic craft, which figures so prominently in the original trilogy, is definitely going to be around. We’ve seen multiple photos of the ship being constructed on set, as well as from the interior of the old girl, not to mention Kevin Smith talking about how stepping onto the set at Pinewood Studios was a transcendent moment in his life. Don’t worry, you’ll see the Millennium Falcon, but it might not be Han Solo at the wheel. That’s interesting. What could it mean? 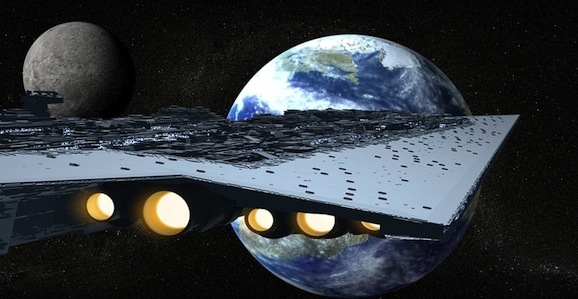 Did Han and Chewie steal the Star Destroyer? Is Han posing as an Imperial? Did they sell out and join the bad guys? Did the death of the Emperor at the end of Return of the Jedi maybe lead to more rational forces taking over the Empire (did the Rebel Alliance swoop in and seize the reins of power and the already extant government structure)? One cool piece of this puzzle, however, is that Han reportedly gets to use a lightsaber in the new movie, which should be a lot of fun and get some oohs and aahs and cheers from the crowds. There are a million things this could indicate, but there’s one thing that seems to carry through almost every last rumor we’ve heard. It doesn’t sound like the Empire is quite as dead as we all assumed after the Battle of Endor and the destruction of Death Star 2. How exactly that works out, we’ll have to wait and see, but if any of the reports we’ve heard are accurate at all, there are at least remnants of it still floating around. Back to the Falcon. If Han isn’t at the controls of the old bucket of bolts, who is? According to this report, it’s Oscar Isaac. There isn’t much known about the character, or why he is in possession of Han’s beloved ship, but he is described here as “the Lando Calrissian of this movie.” He even reportedly wears a long cape (here’s hoping he also has the mustache and even a fraction of Billy Dee Williams’ swagger). Over the last few days we’ve got a lot to consider in regards to Star Wars: Episode VII. True or not, all of these reports provide a number of things to think about and discuss. We doubt that Disney or Lucasfilm, or even anyone involved in the production, will come out and officially confirm any of this, and we suspect we won’t know anything for sure until we see the movie for ourselves on December 18, 2015. But for now, enjoy the speculation. Imperial Han? Flying a Super Star Destroyer? This sounds ridiculous…. Prob fake. The “new” x-wing is actually an older incom design, the Z95 headhunter. Reference: The essential guide to vehicles and vessels. Actually the new X-Wing is based on original Ralph Mcquarrie concept art in which the engine “splits” when the wings open. The Z95 Headhunter has 4 small engines, like an X-wing, and only 2 blasters. This one has 4 blasters like an X-Wing. The official Star Wars twitter also called this an X-Wing. Ah, thank you for pointing that out. I think I need to go back through that guide again.